Established in 1995, the Mehli Mehta Music Foundation (MMMF) is a not-for-profit organization that promotes western classical music through the presentation of high quality concerts and music education for children. The Foundation honours the late Mr. Mehli Mehta ( 1908 – 2002 ) , a conductor and violinist who lived in Bombay until 1954 before he emigrated to the UK and subsequently to the US, where he was conductor of the American Symphony for 33 glorious years. Between 1930 and 1954 he mentored a whole generation of aspiring musicians in Bombay and was the Founder of the Bombay String Quartet and the Bombay Symphony Orchestra. The MMMF’s mission is to create greater awareness and appreciation of western classical music, to share knowledge and understanding of this music, and make music education and the joy that comes with it, accessible to all. The MMMF is dedicated to initiating, assisting and implementing the process of opening its doors and the doors of the city of Mumbai to the music of the world. 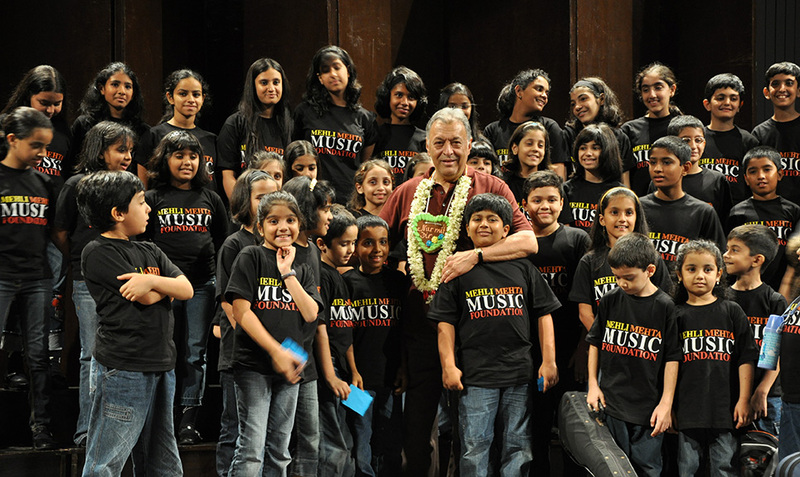 The Foundation is most appreciative and deeply indebted to Zubin Mehta for his personal involvement in all aspects of the Foundation. The Foundation has also raised the public profile of western classical music through its presentation of some renowned international orchestras, soloists and ensembles in Mumbai, and its annual Chamber Music Festival “Sangat“. MMMF takes pride in bringing internationally reputed western classical music artists to India. Over the last 20 years, the MMMF has exculsively presented high quality concerts, chamber music ensembles and solo recitals. Sangat, the first ever chamber music festival initiated in Mumbai by the MMMF, had 19 successful seasons and became a significant meeting point for exceptionally talented Indian and international musicians. More than 250 artists including some legendary musicians have performed for the MMMF – Andrea Bocelli, Mstislav Rostropovich, Daniel Barenboim, Itzhak Perlman, Pinchas Zukerman, Lang Lang, Gil Shaham, Alberto Lysy, Placido Domingo, Yuja Wang, Midori, Denis Matsuev, Yefim Bronfman, Alexei Grynyuk, Boris Berman, Pascal Roge, Sarah Chang, David Garret, Julian Rachlin, Diana Damrau, Barbara Frittoli, Fabio Satori, Julia Fischer, Olga Kern, Alan Gilbert, Inon Barnatan, Arabella Steinbacher, Dan Zhu among others. The Foundation’s education programmes cover a wide spectrum of activities including early music education, group classes, instrument lessons, choir, string ensemble, chamber music, theory and history of music classes. Your support is crucial to our development and mission to make music accessible to everyone.